The satellite weigh 3.8 tons, constructed by Boeing and was blasted into space from Cape Canaveral Air Force Station on board an Atlas V Rocket and Centaur second stage booster. The satellites has been designed to operate for more than 15 years in Geosynchronous orbit. TDRS-L is the latest addition to NASA’s TDRS network of satellites, which enable the nearly continuous communication between mission control and orbiting exploration and research spacecrafts in LEO (lower Earth orbit). The TDRS system of satellites brings back all the data and video from the ISS and supports data transfers from the Hubble Space Telescope. 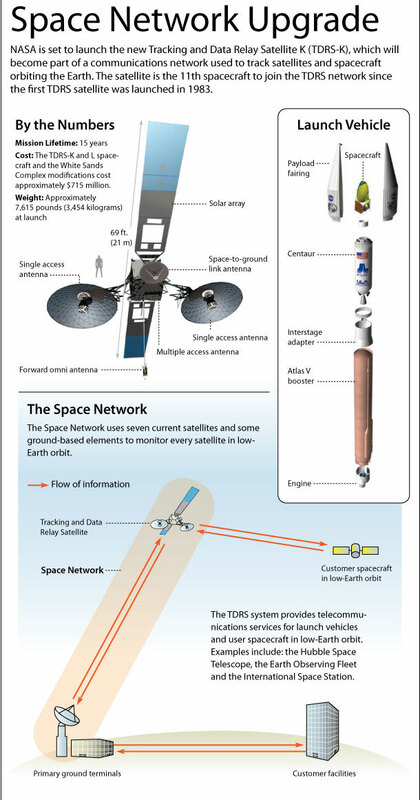 You can check out this informative info-graphic about TDRS-L from Space.com. Before the TDRS system of satellites in the early 1970s, NASA could have a connection with its orbiting spacecrafts only 10% of the time, because it relied only on ground stations to communicate. After TDRS’s first launch in 1983, NASA has been maintaining the system with currently eight TDRS satellites orbiting around Earth. You can read more on Space.com here.